You are here: home » Basics » Basics » Heretofore » What is an Evacuated Tube? 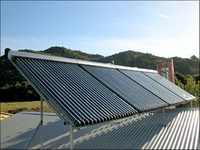 Glass evacuated tubes are the key component of the Solar heat pipe evacuated tube solar collectors. 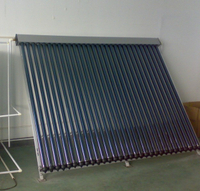 Each evacuated tube consists of two glass tubes. The outer tube is made of extremely strong transparent borosilicate glass that is able to resist impact from hail up to 25mm in diameter. 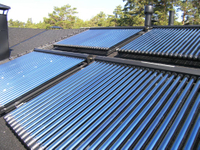 The inner tube is also made of borosilicate glass, but coated with a special selective coating (Al-N/Al) which features excellent solar heat absorption and minimal heat reflection properties. 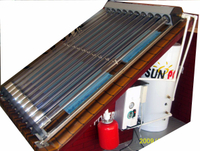 The air is withdrawn (evacuated) from the space between the two glass tubes to form a vacuum, which eliminates conductive and convective heat loss. 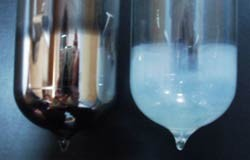 In order to maintain the vacuum between the two glass layers, a barium getter is used (the same as in television tubes). During manufacture this getter is exposed to high temperatures which causes the bottom of the evacuated tube to be coated with a pure layer of barium. This barium layer actively absorbs any CO, CO2, N2, O2, H2O and H2 out gassed from the tube during storage and operation, thus helping to maintaining the vacuum. The barium layer also provides a clear visual indicator of the vacuum status. The silver coloured barium layer will turn white if ever the vacuum is lost. This makes it easy to determine whether or not a tube is operating correctly. See picture below.